There are a few model airplane accessories that you must have when flying your nitro-powered airplane. Some tools and gadgets mentioned here are not a necessity but are highly recommended and will make your trip to the flying field much more enjoyable. The equipment that you take along with you when you go flying is commonly referred to as field equipment. This page will give you a good idea of what most pilots keep with them at the flying field. When nitro engines are having a good day, you could probably get away with using a chicken stick to get them started. A chicken stick is basically a padded wooden stick used to give the propeller a good flip. If your engine is tuned in and ready to go, it should only take a couple flips to get her going. Whatever you do, never ever use your fingers to flip the prop unless you are wearing thick leather gloves. Having missing fingers will definitely hinder your flying experience! Just like an old car, most engines have days where they need to be cranked over and over and over to get them going. In reality this happens quite often with these nitro engines. If all you had was a chicken stick you would never get it going. A chicken stick is a convenient tool to have once you get the engine started and tuned in. 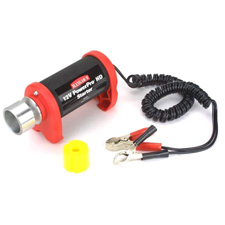 A 12V Electric Starter is one of those model airplane accessories that you must have if you plan to fly a glow engine airplane. 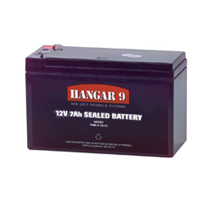 A 12 volt field Battery is needed to power the electric starter. 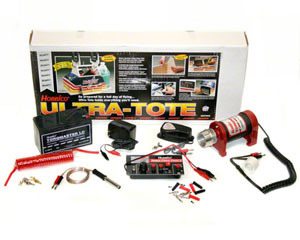 The battery can also power your control panel, field charger, and electric fuel pump and any other model airplane accessories that need 12-volt power. 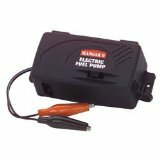 A 12-volt wall-wart charger is needed to charge the battery the night before you go flying. A source of electricity is needed to get a glow plug hot when starting the engine. There are two ways to provide this electricity. A glow plug clip plugs into your power panel and clips on to the top of the engine's glow plug. The amount of electricity going to the plug can be adjusted by the power panel. The power panel will also indicate when a glow plug is burned out. 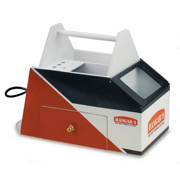 A glow ignitor (sometimes referred to as a glo-starter)is similar to a glow clip except it has its own power source. These are very convenient little model airplane accessories to have because you can just clip them on the engine's glow plug with no wires attached. Many power panels provide a place to charge the glow igniters while at the flying field. This is one of the model airplane accessories that every nitro pilot carries a four-way wrench in their field box. This is used to replace the glow plugs. The four sizes on the wrench fit all standard glow plugs. Due to the tight space between the glow plug and the cooling fins on the engine, standard sockets can not be used to remove most glow plugs. You will need a fuel pump to transfer the fuel from the fuel container to the airplane’s fuel tank. There are basically three types of fuel pumps available. The cheapest is a bulb pump. With a bulb pump you simply squeeze the bulb then put the end of it down into the fuel and release the bulb. This causes the bulb to fill with fuel. Then you squeeze the bulb again to push the fuel into the airplane’s tank. This process is repeated until the airplanes tank is full. Unless you have plenty of time on your hands and are a complete tightwad, I would not recommend this type of pump. The second type is a manual fuel pump rc . You put the suction side into the fuel container and the discharge side into the airplane’s fuel tank. You crank the hand-crank that is similar to a fishing reel handle until the tank is full. The third type is an electric fuel pump . These plug right into your power panel.The suction side goes to the fuel container and the discharge side goes into the airplane’s fuel tank. You flip the switch on the pump to the right to move fuel from the fuel container to the airplane. When you are finished flying for the day you simply flip the switch to the left to move the fuel from the airplane back to the fuel container. Either the electric or hand pump should be fine. I personally would not get the bulb pump. You want to fly your plane when you go to the field, not pump fuel all day! I have always used electric pumps. Just make sure that you have an inlet filter on the hose coming from the fuel tank regardless of which pump you choose. This keeps any dirt or debris that may have gotten into the fuel container from getting into your engine. You will also want to buy a cap fitting so the top of the fuel container is always closed off to prevent any dirt from settling into the fuel. A field box (sometimes called a flight box) is what houses all of your field equipment. A field box will have a compartment for the 12-volt battery. A good field box will have several drawers to store all of your small model airplane accessories. Most field boxes have a place to hold a gallon container of fuel. A control panel and field charge can be mounted to the face of the flight boxes. If you're lucky you run into some great deals on field boxes loaded with goodies at rock bottom prices on eBay. If you're just getting started in the hobby it will be much cheaper for you to purchase all of the "essential" model airplane accessories together a single package. The Hobbico Field Box Complete Combo covers all the bases. 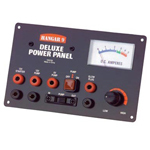 A power panel is connected to the 12-volt battery. It will have places to plug all of your electric equipment such as the electric starter, fuel pump, and glow plug clips. A power panel will also have a variable control knob and a DC amp meter that lets you adjust the amount of current going to your glow plug. This is also handy for checking for burned out glow plugs. Hand held tachometers are neat little gadgets that tell you how fast your engine is running. These are most helpful when tuning a 4-stroke engine. You can normally tell if a 2-stroke is tuned by performing the pinch test. The pinch test doesn’t work so well on a 4-stroke engine. Without a “trained ear” it is difficult to tell if your 4-stroke engine is tuned properly by performing the pinch test. If you plan to get a 4-stroke engine you really want to buy a tachometer. This model airplane accessory is really not not that expensive and will help you prolong the life of your engine as well as maximize its performance. Transmitters and receivers alike need to be charged overnight before heading to the flying field. If you’re like me and plan to stay at the field for several hours, then a quick charger is one of those model airplane accessories that is a must have! Most quick chargers can be mounted into your flight box just like the power panel. You can charge your batteries in less than 15 to 20 minutes while at the field! A good field charger will be able to charge NiCd, NiMH and LiPo batteries. If you don’t plan to be at the field for more than 3 or 4 flights then you can get by without a field charger. I have and recommend the Hobbico MKII field charger. This is two chargers built into one making it easy to charge both your transmitter and receiver batteries at the same time while at the field. There are several brands and models of field chargers. As with just about all model airplane accessories, with a little patience you can probably manage to find a steal on eBay. If you're like me you may live far enough away from the field where you don’t have the luxury of going every day. I only have time to fly my glow engine airplanes on the weekends. For this reason I am prepared with all the model airplane accessories I can think of when I go to the field! I want to stay until the sun goes down! Here are a few things I always keep with me to keep my planes in the air until I am ready to leave. Every pilot brings extra propellers to the field. Most field boxes have a place to attach your extra props. All it takes is one rough landing to break a prop. Time at the flying field is sacred! Don’t let a broken prop send you packing! You never know when a glow plug is going to bite the dust. Always keep a couple extra with you. You may even be the hero of the day when someone needs a plug and you just happen to have one! Some times your engine will just not run right and you finally determine that the problem is a pinhole in the fuel line. It happens to all of us. If you have spare fuel tubing with you then you will be prepared. You’ve been waiting all week to get to the flying field and on your first flight of the day you have a ruff landing causing some minor damage. Many times some CA glue, accelerator and a roll of clear tape (for temporary covering) can get your airplane in the air again! A small rechargeable electric screwdriver makes installing and removing your airplane’s wing a snap! Its not an essential but it sure does make things easier. 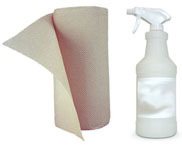 Always have paper towers and cleaning solution ready to clean all the oil off of your plane before you bring it home.